Powdery Mildew is a recognizable and very common fungal species that affects thousands of plants. 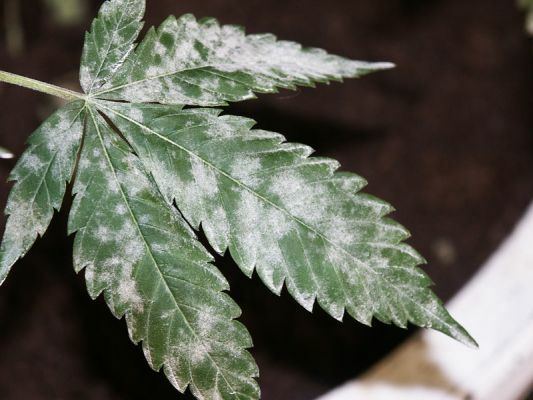 The white dusty coating on the surface of the plant is caused by several hundred-different species of fungi that are known to cause powdery mildew. Generally, the fungi are host specific and only affect plants from the same genus or family. Infection can cause severe damage to a plant, specifically the surface of the plant, reducing yield and quality. Powdery Mildew is an obligate biotroph (parasite) which means it needs a host to survive and proliferate. It is commonly found on cannabis and attacks the plant by vascularizing into the plant tissue and it is able to obtain nutrients by feeding from the plant. The production of condiospores are dispersed to various parts of the plant and spread to other plants through the air. Once the condiospores diverged onto a plant they prepare the infection and facilitate fungal development. This process leads to a formation of an appressorium that penetrates the host cell cuticle and once that is successful the formation of haustoria develops and absorbs the nutrients. This life cycle phase of asexual reproduction is continuous and by the 4th day from primary infection micro colonies appear visible on the plant (For details, see Ridout et. al 2009). In spring, extensive powdery mildew outbreaks are promoted by the right humid conditions and overcrowded plants that are cool and damp. During the winter months, they mostly survive in the primordial leaves, shoots, or flower parts of the plant. Therefore, it is very unlikely that powdery mildew can only affect plants during the warm weather period. Proper cultural practices are important to manage the disease effectively but implementing a complimentary screening tool can help prevent further spread to neighboring plants. Mother plants and cuttings should be screened and treated preventively so that valuable genetics are not lost. Early detection before sporulation is the key to help eliminate powdery mildew. There are very few treatments to eradicate powdery mildew and with many states banning chemical fungicides in the medicinal cannabis market, other forms of organic treatment are shown to suppress the fungi not kill it. Understanding the physiology of powdery mildews and their interaction with the host plant can help to improve disease management.